#1 Game JERSEYs & SOCKs! Samples are in the Pro-shop for you to try on. Submit Order Form, Send Email to info@HatTrickHockey.net or stop in to see us. Custom Jerseys take 3 weeks to produce. #2 Top Priority is Head protection! due to different Fits(IMS fit rounder heads) we are carrying a big selection in the following Bauer Helmets for Travel Players: (IMS 9.0, Reakt 75) all in Custom colors. We also have a big selection of Bauer or CCM Cages in silver, black, or WHITE! #3 Team Adorned Bags by Harrow and possibly others will be on-hand or can be Ordered for Discounted pricing. Rugged Carry Bags decorated with Team Logo are now on hand in Pro-Shop. #4 Team Gloves We stock many custom-Colored (i.e. Navy/Silver, Black/Gold) choices in all levels and sizes, where we can assist in narrowing down what is the most appropriate. With the variety of styles and fits we are sure to have something on the rack. Special Team Orders can be placed for Bauer, Eagle & all other brands. #5 We also carry a variety of Pant Shells that can be Team-Embroidered available for Sizing. Just pull this over any existing pant or Girdle and that's all you need. (Philly PX, CCM, Easton, and Bauer on our Rack for Mites on up). #6 Easton, Bauer, CCM Warm-ups Warm-up Samples are in the Pro-shop for you to try on at any time. #7 Work-out Apparel Package: Lightweight Performance T-shirt & Shorts, like the (Easton Spirit wear or RBK Speedwick under apparel) are a great option for off-Ice workouts. Team Decoration can be ordered. #8 Outer Wear new Optional offering for your team- CCM or Bauer Heavyweight Winter Jackets. We have a full size run and we will be doing Fittings in September for Team or Indvidual-Order basis. Team Embroidery can be added, locally. #9 Practice JERSEYs & SOCKs! Samples are in the Pro-shop for you to check out. Practice Jerseys take just 3-5 days to deliver and are inexpensive ($10 to $15). 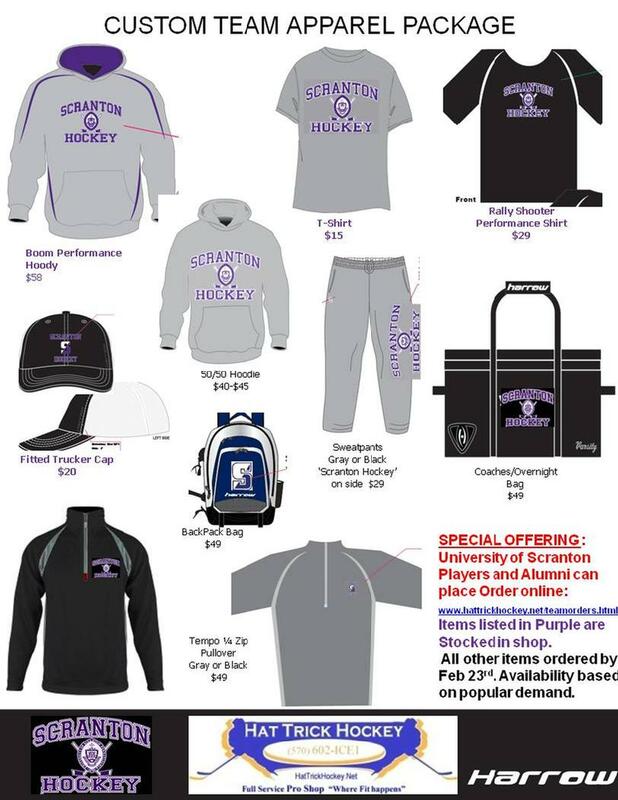 Submit Order Form, Send Email to info@HatTrickHockey.net or stop in. We can also Heat-press Numbers & Logos right in the Shop to save more time & money. #10 Team Apparel View some sample Decorated products below showing what we carry throughout the season. What can we put your Logo on? Download and Complete the form. Submit with your Names/Numbers/Sizes via Email/Fax/Drop-off. Orders can be submitted on an indvidual basis, and we will accumulate altogether by the deadline. It is that easy! Please double check your information before submitting, as we are unable to change personalized orders once an Order is placed. REWARDS PROGRAM- Equivalent to 10% Discount on EVERYTHING! Even your Discounted Gear can go on the Program. (For every Dollar spent, get $50 back when you reach $500. No gimmicks with late Mailers either). PRICE MATCH- opportunity to buy local, get advice & exchanges, and Free shipping. TRADE-INS- Why not get Credit applied to make your purchases less expensive? We give you Credit back for the old gear. SKATE SHARPENING- No doubt what everyone is saying, "Hat Trick guys are the Best!". We have 13-Pack Sharpening Cards available to make it easier. STICK PACKAGES- On certain higher-end models, get a Discount: (2-pack @ 10%), (3-pack @ 15%).